The CES program measures non-farm wage and salary employment. Estimates are produced for the States and Metropolitan Statistical Areas. Arizona also provides unofficial estimates for counties. Farm employment, private household employment, and self-employment are excluded. The program publishes estimates for various industries, based on the North American Industry Classification System (NAICS). Estimates are based on a survey of government and business, often referred to as the establishment survey. Estimates are released monthly. Revisions are made the following month and a benchmark revision is made at the end of each year. 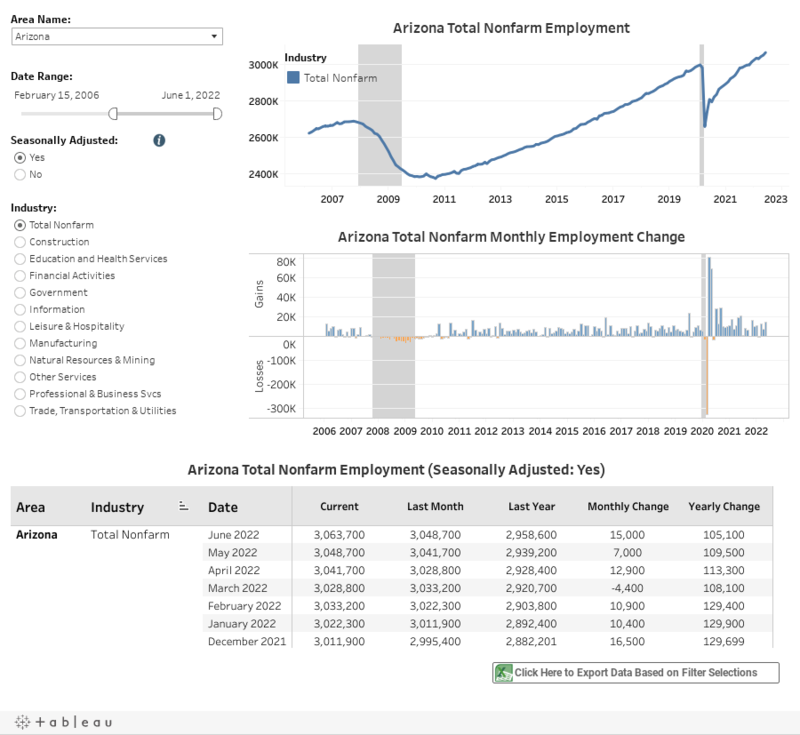 The Growing and Declining Industries report contains data for Arizona statewide and by county. This report is based on the last 3 years of available QCEW data and is not a forecast. See the notes page of the report for details on the methodology used. Link to the query tool opens in a new browser tab or window. NOTE: Starting with the data for 2011 the program has been using NAICS 2012.
Business Employment Dynamics (BED) is a set of statistics generated from the Quarterly Census of Employment and Wages program. These quarterly data series consist of gross job gains and gross job losses statistics from 1992 forward. Gross job gains and gross job losses reveal some aspects of business dynamics, including establishment openings and closings and establishment expansions and contractions. These data help to provide a picture of the dynamic state of the labor market. The Bureau of Labor Statistics website has an overview of the BED program and charts and data tables on Arizona. Arizona Statewide and MSA data on average weekly hours, average hourly earnings, average weekly earnings by major industry for non-supervisory employees only. Arizona Statewide and MSA data on average weekly hours, average hourly earnings, average weekly earnings for all employees. Arizona statewide seasonally adjusted data on nonfarm employment. Arizona Statewide, MSA and County, not-seasonally adjusted, data on nonfarm employment.